Now I am not an aviation nut, but like many I’ve always been interested in flying things….kites, RC helicopters etc. Recently on the site I have talked about projects that getting ready to release products on kick-starter and related crowd sourcing websites, but this time I have one for you which has been successfully funded and is selling online. 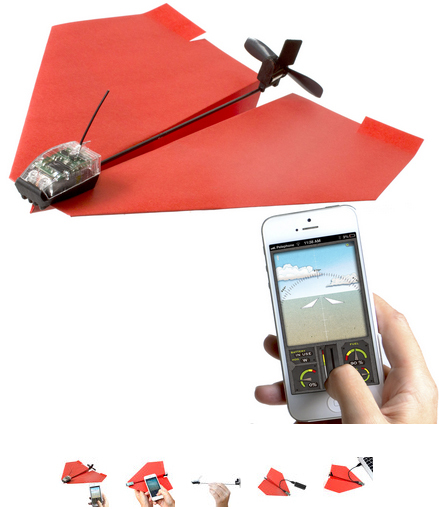 PowerUp 3.0 turns a self-made paper aeroplane into a smartphone controlled flying machine. Inside the package you will find a Bluetooth powered smart module, all the cables to get it charged and going, a charger pack, propeller/rudder and spare parts plus a selection of paper plane templates and the all-important user guide. Half an hour is all it takes to learn how to fold a compatible plane design while charging the smart module and assembling the motor controls to your plane then a free download for iOS and Android can begin to get you flying. As with any new flying gadget there it may take a little bit of time to master controlling your plane but when you do get the idea, you simply use the phone as a paddle and a throttle control is accessible on the screen. Flight time is reasonably tidy considering the time it takes to charge and you can expect at least 20 mins of fun in the park with this one. The unit will set you back $50 from fishpond.com.au and you can get one in time for Christmas if you order now.